At the end of last year I tried the Nail HQ Rubberised base coat and Ridge filler base coat (post here). I wasn't blown away by the rubberised base coat (although I think that's more down to my nails than the product) but I do like to use the ridge filler base coat if I'm going for a matte nail look. 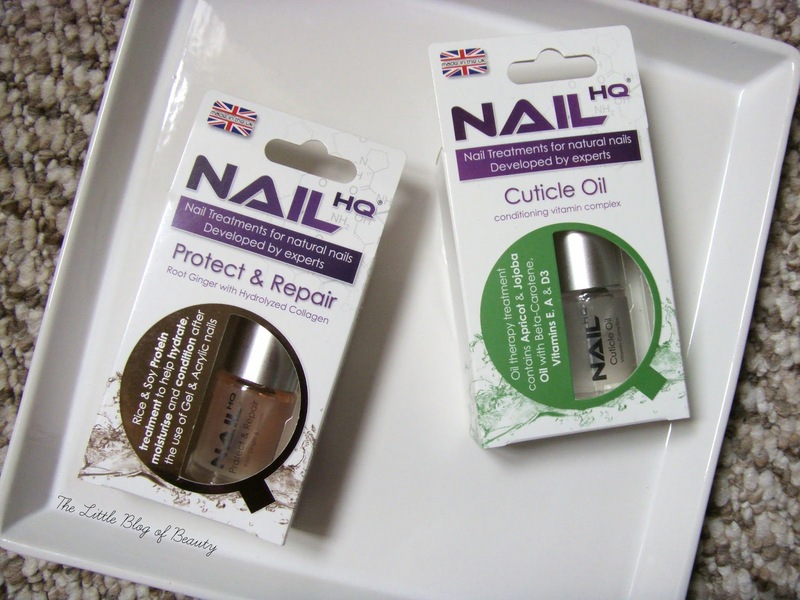 At the beginning of this year I was again asked if I'd like to try some Nail HQ products and as there are nine products available in the range I thought I'd try a couple of different ones. I was sent the Protect and Repair treatment/base coat* and the Cuticle oil*. The cuticle oil contains jojoba oil, apricot kernel oil, beta-carotene and vitamins E, A and D3. This is a pretty standard thin oil with no scent that I can detect. As with most cuticle oils I like to brush this on and leave it to soak in for 10 minutes or so while I type away. I then massage this in before wiping away any that is left behind and it does the job. At £6.99 I would possibly like to it to be a little cheaper but it's not a bad price and you use so little each time it will last an age. When it comes to the Protect and Repair I have to say I'm really quite impressed with this. This contains root ginger, rice and soy protein and hydrolysed collagen. Even when I don't have nail varnish on I don't tend to use strengthening treatments (I think because I like either colour painted nails or bare nails) so I usually use this sort of thing as a base coat. The first time I used this I removed my nail varnish and was surprised to find that it appeared to have made a significant difference from the first use. I thought maybe it was just a coincidence, that my nails just happened to be in slightly better condition at that time, but I then lent this to my mum (whose nails have been really quite bad recently) and she found the same thing. She said after the first time she used it she removed her nail varnish and was impressed to find that her nails had already improved. It's worth noting that I got hold of a bottle of OPI's Nail Envy for my mum to try and help sort out her nails and she said she's seem a much slower improvement with that than with this. So if you've thinking about trying Nail Envy but are a bit unsure about the nearly £20 price tag (although you can find it cheaper, I think I managed to get it for around £13) it may be worth giving this a try first at just £7.99. Prices range from £5.99 to £7.99 and you can find Nail HQ in Tesco stores and online on Amazon.